Armed militias have taken control of two local government areas in Cross River State and displaced virtually every civil authority in the area. The militia, generally believed to be members of Bakassi Strike Force, had been operating in the area for some time. But they recently seized control of Bakassi and Akpabuyo local government areas, displacing both civil and traditional authorities in the councils. It was reliably gathered that the elected chairmen of the two local governments had fled the area for several month now, while the councillors hold their legislative sittings in Calabar. The secretariats of both local councils have also been deserted by civil servants for fear of being kidnapped or attacked by the militants. Militancy has gripped Cross River State for the past few months. And militants are being blamed for an increasing wave of kidnapping, armed robbery, and other criminal activities, especially, in Calabar, the state capital. But Bakassi and Akpabuyo local government areas, which share maritime boundary with Cameroon, recently became a lawless, anarchic zone in which militants rule. It was discovered that the militants collected rents and levies from people doing business in the council areas, which they termed “protection money”, a situation that has made many people to flee. 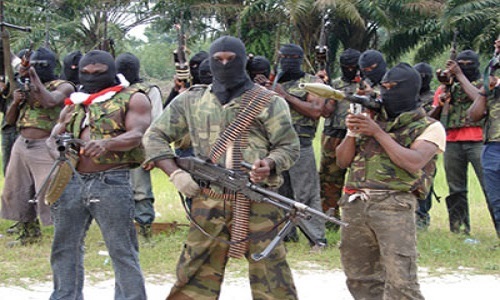 The militants are said to have also rendered the state judicial organs and the traditional institutions in Akpabuyo and Bakassi local governments impotent, as the militias now handle matters that should otherwise be handled by the conventional courts, village heads, clan chiefs, and paramount rulers. A source conversant with the situation, but pleaded not to be named, said, “There is total anarchy there now, and people are actually running to Cameroon now for help. First of all, the local government chairmen in both places don’t go to office, and they have not gone to office over the past one and a half years. They have written, complained, begged, and appealed, to no avail. “The legislatures in those places don’t meet at the local government headquarters. They hold their meetings in Calabar so as to fulfil the statutory requirements that they hold a certain number of meetings in a session. The source said the locals had made a failed bid to contain the armed men. “The traditional institutions have tried to fight, but they can no longer sustain the fight. They don’t have guns, they don’t have money,” the source stated. “What we have now is that militants have set up a parallel government. They are the ones that resolve land disputes, they are the ones that resolve family disputes, and if husband and wife quarrel they go to militants. Of course, their methods are crude but effective. Though, as gathered, there are police posts and soldiers stationed in the areas, the security agents appear to be overwhelmed by the militants. When contacted, the chairman of Akpabuyo Local Government Area, Mr. Patrick Ene Okon, refused to speak on the issue. But the chairman of Bakassi Local Government Area, Mrs. Edisua Usang Iso, admitted that militants were operating in her council area. She, however, denied that the activities of the militants were affecting the administration of the council. Iso said, though, the council had lost substantial revenue to their activities, the federal government should grant amnesty to them and incorporate them into the federal government’s amnesty programme for Niger Delta militants. The Bakassi local government chairman denied abdicating her duties and deserting the council secretariat, saying she goes to Bakassi whenever it is necessary. However, confirming the occupation of the Bakassi area on Friday, when he addressed the press on the security situation in the state, Ayade vowed that the militants will be dislodged from the area. The governor said, “The three kingpins, we have identified their homes, we have the coordinates of their armoury, we have a clear picture of their modus operandi and we are working on a massive attack. I speak as the United States would do. They let you know that they are coming for you and they will come after you. Addressing newsmen yesterday at the Peace Park, Calabar, shortly after a five-hour security council meeting, the governor, accompanied by service commanders in the state, as well as his security adviser, unveiled a new security agenda aimed at containing the emerging threat in the state.